We love our planet and always try to find new ways to preserve it’s nature for our generations to come. Using recycled or biodegradable materials in making of packaging boxes is one of many ways that we have adopted to participate in go green initiative. Food items packaging boxes always needed to adhere the food safe packaging laws and are made with materials that can either be recycled or disintegrated by bacteria, fungi, or other biological means. 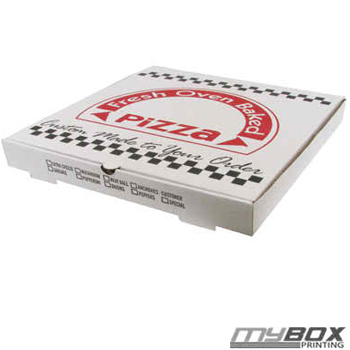 Pizza boxes are made from corrugated cardboard which are easily recycled, however the cardboard becomes soiled with grease, cheese, and other foods once the pizza has been placed in the box. Once soiled, the paper cannot be recycled because the paper fibers will not be able to be separated from the oils during the pulping process. So Can We Recycle Pizza Boxes? Problem with the recycling of pizza boxes is the food, grease and cheese stains that get stick to inside of pizza boxes and oil in them contaminates the fiber of paper cardboard. Recycling involves the process where paper products are mixed with water to convert them into slurry. The oil causes great problems for the quality of the paper, especially the binding of the fibers. It puts in contaminants, so when they do squeeze the water out, it has spots and holes. It doesn’t mean that we cannot recycle pizza boxes at all but it does mean that we have to take some steps individually. Easiest solution to this problem is to cut or tear out the soiled portions of your pizza boxes and trash them. For Example, if the top part of the pizza box contains grease stain but the bottom part is clean, then you can tear the top half and throw away and put the grease free bottom part in the recycle bin.